Dice is an exciting and extremely noisy game with lots of shouting and cheering. The complex betting layout makes it appear more difficult than it actually is. The basic game is relatively easy to learn. 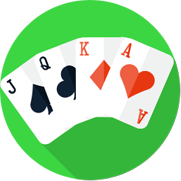 Although the layout incorporates a wide choice of bets, in practice only a few are worth playing. Players take turns to throw two six-sided dice the length of the table/pit. The dice must be throw together and must hit the wall at the opposite end of the table. Of course we will not have to worry about this, because we will be playing the Microgaming Online version of this. But it is good to know the basics of the games. Players predict whether or not the shooter (the person throwing the dice) will throw a winning or losing score. The first throw of the dice is called the come-out-roll. A first throw of 7 or 11 is a winning score. A throw of 2 ,3 or 12 is a losing throw also know as 'craps' . Any other score 4,5,6,8,9 or 10 means that a point is e3stablished. WHen a point is established, the play will try to make the point by re throwing the dice any number of times to repeat the original score. If the original score is thrown before a 7 or 11, it is a winning score. If 7 or 11 is throw first, it is a losing hand. When it is your turn to be the shooter (the person who throws the dice) you must bet on 'win pass' or don't pass'(win or don't win). Your continue to throw until there is a losing decision (a miss out). The first throw is called the come out. If 17 or 11 is thrown, the bet on the pass(win) line wins and the bet on the don't pass line loses. If 2,3 or 12 is throw the bet on the pass line loses, and the bet on the down pass line wins. If a point is established ( a score of 4,5,6,8,9 or 10), the shooter continues rolling the dice. If the point is made (the original score re thrown) the pass bet wins and the don't pass bet loses. If a 7 or 11 is thrown, the don't pass bet wins and the pass bet loses. There are a wide range of bets. Try to familiarize your weld with the and learn where they are placed, before you begin to bet. 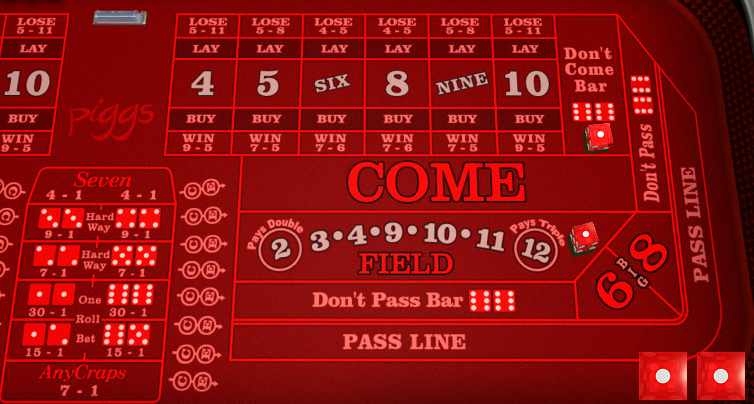 Here is a screen shot of a Microgaming Craps table on Piggs Online Casino. They cannot be removed or reduced after the point is established. It wins if a 7 or 11 is thrown on the come-out-roll or if a point is made. It loses if craps (a score of 2,3 or 12) is thrown on the come-out-roll or if the shooter fails to make a point. Odds of even money are paid 1:1. This is the opposite of pass. After a point is established it can be reduced or removed. The bet wins if craps is thrown on the come-out-roll or if they shooter fails to make a point. It loses if 7 or 11 is thrown on the Come-Out-Roll. These are additional bets that can be made once a point has been established. Your must have a bet on the pass, don't pass, come or don't come. The bets are paid out the true mathematical odds and are worth playing as the house advantage is reduced. 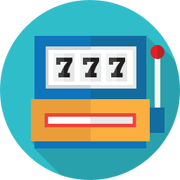 However, Microgaming Casinos limit the amount that you can bet. This is a bet on the individual scores of 4,5,6,8,9 or 10. It wins if the score selected is thrown before a 7 is rolled. These bets can be made at any time. They are places by the dealer. You simply place the bet you want. Place bets are off at the come-out-roll unless you call them on. the bets can be increased, decreased, removed or called off at anytime. There are 36 ways in which the dice can be thrown. A score of 7 can be made in six different ways and a score of 11 can be made in two ways. A point can be established in 24 difference ways. There is only one way each of throw 2 or 12 and two ways to throw a 3.Therefore you stand a fairly good chance of either throwing a natural or establishing a point on the come-out-roll.